Unique handcrafted key shaped pendand made in sterling and fine silver. Amazing ammonite fan was set using various techniques. 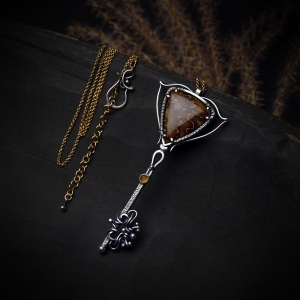 Microfaceted citrine set in the key and vermeil chain the pendant hangs on make the whole piece lit with a soft yellow glow. The piece was oxidised and polished. The key is 8,5cm long and 3,7cm wide. The chain is 80cm long + 5cm of extension.